This page lists all reports that for Holland only that do not involve other countries. Click here for a list of all reports involving Holland. Target: Cycling as much as possible through the countryside, on asphalt and dirt roads, far away from motorized traffic. Organizzare un viaggio in bici in Olanda predispone a perdere la testa nel confrontare 260 itinerari per 15.000 km. - avete letto bene - tanti sono quelli proposti che vengono inviati su richiesta dall'ente turismo olandese. Gli itinerari corrono tutti su vere e proprie piste preferenziali ciclabili a tutti gli effetti. Queste sono ovunque: nelle città nelle periferie, nei villaggi, nelle campagne. Dove c'è una strada, ai suoi lati esiste una corsia preferenziale per il traffico in bicicletta. Le biciclette sono migliaia. Le piste come tavole di biliardo. This the story of our cycling trip from Den Haag to Amsterdam via the Noordzee route. We camped along the route. We also visited Amsterdam. Many pictures are included. We have done this cycling tour in the Netherlands with our parents and it was the perfect destination for such family trip. We have combine bike and car and covere the most of the Netherlands in one week. So just how interesting can grass verges get? 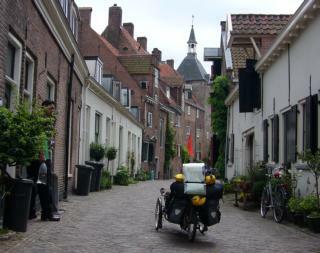 A three day trip through the loveliest middle bits of the Netherlands on recumbent trikes. Ten minutes on KMX trikes at the Bikemotion Benelux Fair in Autumn 2006 convinced us that recumbent trikes were actually very cool. A few months later at another fair in Essen in Germany, we were able to try out an ICE Trice and a HP Velotechnik Scorpion. They were cool too! We did, however, realise that there was a big difference between ten minute sessions in a crowded exhibition hall and using these HPV's on a daily basis. So, when Damae found a shop that hired out trikes, we picked a three day weekend in late May of 2007 and headed off towards the 'Hoge Veluwe' on a Trice and a Scorpion. So how did it go and what have we learned? Well there are lots of thoughts and impressions in the travelogue of the trip together with videos and pictures. There is also a short comparative review of the Trice and Scorpion which draws our thoughts together. Last but not least, some conclusions and our recommendations. Do still think they are cool? Of course we do! Easter 2007: Four friends, four bikes and four provinces. From Hoek van Holland to Delfzijl in four days. We decided to do the Dutch NSCR from Hoek van Holland to Delfzijl in the Easter break just for fun. The North Sea Cycle website suggested it was only 320km, ``No problem'' we thought. However by the end of the third day we had passed that total and we still had some way to go. Fortunately we had good luck with the weather and managed to complete the tour. There was even time to drink coffee and eat lots of 'appelgebak' along the way. 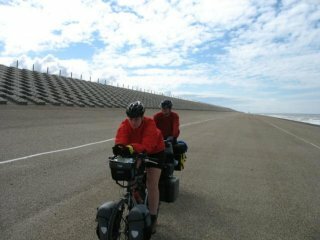 The travelogue includes the story of each day's cycle, with pictures and trip statistics and a gallery. An Epilogue provides a summary of our long weekend and the NSCR in Holland. There is also extra report covering the remainder of the route, from Nieuweschans to Delfzijl, cycled on Bromptons one sunny day in September 2007. The NSCR in the Netherlands is not only a good introduction to what the country has to offer as a cycling holiday destination, but also a great place to start your own North Sea Cycle Saga. We certainly enjoyed ourselves. Descriptions of several short (1-3 days) bicycleroutes in the Netherlands. The plan: Holland, children, bicycles. We figured the rest would evolve on its own. A landscape materialized at once in my head. 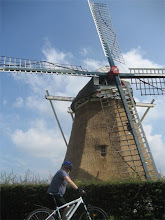 You can imagine the particulars: windmill, tulips, cow, canal, pedaling 12- and 16-year-old. Sunshine. Waving farmer. Cheese. ``Legal weed,'' the 16-year-old chipped in. ``Not for you,'' I said. We bought a Holland guidebook, with many photographs of Rembrandt paintings and elaborately gabled canal-front brick houses, but the Bicycles section was only two pages long and commenced with a photograph of a bike helmet. Ha! (We'll get to that in a moment.) We found what seemed to be a suitable Holland Tourist Board Web site, animated on-screen by a little mustached man who pedaled along as you plotted out various rural cycling routes, but every time I tried to download the maps my computer snarled at me and dumped the site. So we gave up on the advance details, arranged for an Amsterdam apartment that came equipped with the owners' bicycles and landed on a breezy July morning at Schiphol Airport, which is grand and clean and extremely efficient; by lunch time, our bags piled up at the top of the apartment's staircase landing, we were bicycling. Before sundown the next day, we had grasped the essentials. By that second day, I had began composing my own introductory bicycling brochure, to be handed at the border to uninitiated Americans with tulips in their heads. This cycle tour is designed to show you Amsterdam's many varied and often surprising aspects. Not only does it take in the historic city centre, it also shows you other neighbourhoods, and demonstrates that Amsterdam is a city with 'green' credentials. The text provides information about Amsterdam and the measures that have been taken to make cycling in the city an enjoyable and safe experience. The cycle tour is approximately 37 km long. Riding at a moderate pace, it should take you about 4 hours to complete. In Rembrandtpark in Amsterdam West, it is possible to take a short cut making it some 10 km shorter. After a long ride through the dunes we arrived in Den Haag[...] We rode to the Palace of Justice, arriving at 11 AM, just as they were starting their first tour. We quickly stashed our bikes by the guard's post at the gate, paid the fee (f10.00) and took the tour (conducted in English) though the Palace of the International Courts of Justice. After the tour, well worth the cost, we rode over to the ``old area'' near the Parliament buildings and bought our lunch at the place we came to know and love, McDonalds (f15.00). Mike's site hosts reports of his other non-European tours: These trips range in distance from 355 miles (Hawaii) to 6089 miles (Canada) and in time from a week to three months. Giro cicloturistico di 10 giorni nelle pianeggianti regioni del Noord Holland e della Frisia. Un itinerario alternativo ai classici tours dei Paesi Bassi. Then we saw the bikes. My God, the bikes. How can I describe them? Should I even try? Well, why not. They were just normal bikes, after all. A bit clunky-looking. Fat and heavy, but not in a judgmental way. After all, they weren't meant for racing. They were meant for lumbering over cobblestones and kerbs and dumbstruck pedestrian tourists and tram tracks and probably along the bottoms of canals, should the need arise. And they. Were. Everywhere. Even the city aquarium had one in a display tank, dangling like bait above a couple of uninterested fish, and graphically proving, to me at least, that the saying ``A woman needs a man like a fish needs a bicycle'' really means something, at least to fish. Provisions for bicycling in Netherlands presents an inspiring ``alternate reality'' to what is found in the United States. While not a complete utopia, bicyclists' needs are routinely accommodated in a culture that recognizes human-powered transportation as a legitimate mode. Bicycle path along the digital highway, mostly in Dutch. Fairly offensive advertising. De Vraagbaak - Hier antwoorden op de meest gestelde vragen, tests en honderden adviezen van andere fietsers. U kunt ook zelf een nieuwe vraag stellen of antwoord geven. Fietsrouteplanner, Hippe bakfietsen, Slotentest, Fietsenwinkels. Viewed from the saddle: some selected info for foreigners considering a cycling trip in or through the Netherlands, to get an idea of cycling life overhere. This website is a personal, non-commercial attempt to make available the experience of hundreds of individual bicycle tourists who travel some distance to get to a place for their tour. Either we travel with our bikes or we rent bikes when we arrive. We take airlines, trains, buses, or ferries. These are not tourist or recreational cycle routes. They might be interesting for students in in urban planning, architecture, geography, and landscape history. Amsterdam Cycle Route 2: Spaarndam/Velserbroek: heritage+suburban landscape. Ancient sea defences embedded in a peri-urban landscape where farming is giving way to new housing and golf courses: a typical VINEX landscape, with older settlements heritage-ised. Amsterdam Cycle Route 3: dune villas, ruins, and infrastructure The narrow strip of lands just behind the dunes has the oldest continuous habitation: a few traces remain. The dunes are suburbanised since the 19-th century, and cut through by the sea lock complex at IJmuiden into the North Sea Canal. Biking Netherlands - Top biking Netherlands Resources. Welkom op de fietswebsite voor Amersfoort, Nederland, België en Wereldwijd! Dit is de (eerste) website voor fietsliefhebbers, die op zoek zijn naar mooie fietsroutes rond Amersfoort, in Nederland, in Belgi en Wereldwijd. Met de unieke 1-2-3 formule: 1. zoeken 2. printen en 3. fietsen!